War has been declared. A war against science for profit. This war has been going on for a while but the most recent battle-cry has sounded. This fight, depending on who wins, has the potential to destroy our planet and leave it useless for future generations and the main cause is greed. Those so-called scientists who are in the minority 2-3% are selling out their scientific soul for profit and notoriety. Earlier this month, Greenpeace released an epic 60 page report detailing this war on science since the 90s. This report is well written and dives into the various players, “scientists” and those who are being attacked. This is a poignant and timely report since it coincides with the latest IPCC’s pending report on the climate and, in turn, the opposition’’s most recent coordinated attack. As a little bit of background, the IPCC, or Intergovernmental Panel on Climate Change, is an international intergovernmental scientific group consisting of thousands of volunteers to contribute scientific findings, reviews and summary reports for international policy makers on the climate. Think of it as an international body of scientists trying to save the planet by informing world leaders about the climate and how it is changing. The panel’s main purpose is to learn and inform about climate change, whether it is man-made and how to mitigate and adapt to it. The work of the IPCC is so important that the last report it filed in 2007 “led to the IPCC being awarded the Nobel Peace Prize, jointly with Al Gore.” You can see an amazing 90 second synopsis from BBC here. "The individuals, organizations and corporate interests who comprise the ‘climate denial machine’ have caused harm and have slowed our response time. As a result, we will all ultimately pay a much higher cost as we deal with the impacts, both economic and ecological." So, who are these key players? In this post I am going to break it down into 3 main groups, publications, and think-tanks that are part of this cabal and are representing a larger field. These groups are; the Koch Brothers, Forbes Magazine and the Heartland Institute. Three specific and linked cogs of many in a giant machine. Anyone who has been paying attention has heard about the Koch brothers and their practices. As a refresher the two oil barons are worth a combined $44 Billion and over the past 20+ years have plunged their oil-ridden hands into innumerable climate-denial pies. The piece above is from 2011 and echos the most recent attack on climate science. If there is a think tank, foundation, college or campaign out there that is trying to squash the efforts to abate climate change or change our reliance on oil, you can bet that the Koch brothers have had at least some money in the game. Why are the Koch Brothers investing so heavily in killing climate change science? To protect their self interest and to protect their industry. They make billions on exploiting the fossil fuels that contribute to greenhouse gasses. They want to keep the general public ignorant to the scientific facts and the logical steps needed to survive to protect their own business future. The Koch brothers are thinking of short term gains at the cost of our 100 year survivability. News about their ties to various groups and funds rises almost daily. Most recently a story broke about Freedom Partners, a conservative group that has around $250 million in its coffers to shape the national policy discourse. There have also been issues with the Tea Party and various universities across the country. They even have had their minions trying to open the doors for logging and mining interests in public lands through a northern California oyster farm dispute. It is not just think tanks and third party groups that are wrapped around these billionaires fingers, it is also politicians. We can remember the ties to the Mitt Romney campaign and their big push to control both republican and libertarian institutions in the past. Their effective reach is mind boggling. Utilizing this far reaching political net to fuel their interests, the Koch brothers have been pushing politicians directly to effect action against climate change science and mitigation. Since 2008 they have been, in secret, pushing the politicians in their pockets to sign an “anti-climate tax pledge” starting a year after the Supreme Court ruled that the Environmental Protection Agency could regulate greenhouse gasses as a form of pollution. It isn’t that hard to find a direct link from this pledge and failed climate legislation in our corporate subsidized congress. The real factor here to take into account are the paid, in pocket “experts” and “scientists” that are directly and indirectly funded by the Koch brothers and their interests. The self described “Capitalist Tool,” Forbes magazine is a publication geared towards America’s business leaders. It's purpose is to comment on news, politics and innovations to better educate on the financial and business impacts of these elements. Industry, the various stock markets and business in general does not like uncertainty. When there is uncertainty markets tend to fluctuate and the general consensus is that "the status quo is good." It would make sense for those in certain markets, such as the Koch brothers in the oil industry to try and push the "everything is fine" and "business as usual" story to keep their industry making money. For a publication like Forbes, it would make sense to try and accurately depict the industry and its future. When it comes to climate change a publication whose role it was to inform the business elite one would expect it to act in logical manner. Such a publication would trust in the prevailing science, try to inform its readers of practices that would limit the speculated impacts and suggest investment in industry that would supply the demands of abatement and adaptation. Forbes is not acting logically in this situation and there is a simple reason. Forbes, has through out its history published articles fighting against climate science. This last year they have upped their game. So far they have tried to call into question the fact that there is a scientific consensus that it is in fact happening and tried the "name calling" game using terms like "alarmist" and "hysteria" or using misleading headlines and "facts." Most recently they published a tiny article calling into question the concern of sea level rise. To try and shut down the facts, this piece uses an "expert" in the field to one-by-one shut down facts about our ocean, our climate. This "expert" is indeed a scientist, specifically in the field of atmospheric physicist and is known for his work in space research, atmospheric pollution, rocket and satellite technology. Fred Singer, over his professional life, has spoken out extensively on climate issues trying to prove that the climate is not changing, but if it is, it is not caused by humans. If you read the Greenpeace report that I mentioned earlier Singer should be familiar to you. He was one of the many "experts" who have been in the anti-climate change camp highlighted in the piece. He is the founder of the Science & Environmental Policy Project and is an emeritus professor of environmental science at University of Virginia and was a professor at George Mason University for a while. Funny thing about University of Virginia and George Mason University is that both have been linked to the Koch Brothers. As you can see, this expert in the field that Forbes pulls to speak on the climate and the IPCC has some questionable connections. In fact, according to leaked documents, Singer has been receiving $5,000 a month from the Heartland Institute (to be talked about later). You can see for yourself just a few of the "facts" Singer has tried to assert since 2008 debunked here. Singer represents just one of a few “opposition scientists, those that live in the 2-3% of scientists out there that are not in the consensus that climate change is happening. There is actually a response group to the IPCC, the so called Nongovernmental International Panel on Climate Change made of climate change denial scientists like Singer, with close ties to the Heartland Institute. So why would a seemingly reputable publication like Forbes brandish junk scientists and “experts” who are paid to say what the Koch brothers want? Simply put it is because the President and Chief Executive Officer of Forbes Inc. Steve Forbes is on the Board of trustees of the Heritage Foundation. The Heritage Foundation, a “research and educational institution—a think tank—whose mission is to formulate and promote conservative public policies based on the principles of free enterprise, limited government, individual freedom, traditional American values, and a strong national defense,” received a little over $4.5 million from the Koch brothers through various funds from 1997 to 2011 alone. The publication repeatedly lauds the brothers and has even written some very interesting "puff pieces" about them. Heartland Institute is another think tank whose mission, like the Heritage Foundation or the Cato Intitute, is to discover, develop, and promote free-market solutions to social and economic problems. During the next few months, and any subsequent time that the IPCC will provide the public with climate findings, various “experts” will come out of the woodwork to give comment or comment on posts from the “climate change skeptic” camp. It should come as no surprise that there are huge ties between the Koch brothers and the Heartland Institute but there are also connections between this institution and other polluters, like Exxon and the XL Group (XL Pipeline). The Heartland Institute, and their compatriots, are gearing up to spread their message of denying the base science through publications like Forbes, the Wall Street Journal and their own blogs to try and give credence to their claims. 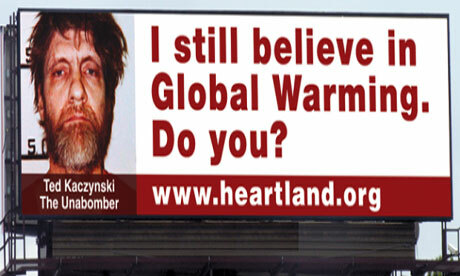 To jog your memories, the Heartland Institute is the organization that was behind such amazingly horrific campaigns as the billboards trying to link a belief in climate change. So we have a system where billionaires are trying to protect their interest by buying elected officials, creating and supporting dummy foundations and organizations who fund their own “experts” to comment in publications they own. This is the echo-chamber that is mentioned in the video at the beginning. This should come as no surprise. This cabal has been trying to do this for decades, before the Kyoto Protocols were even enacted. It even extends worldwide. Back in 2009 a British organization was under fire for their donations and for trying to push the story that the climate change was a “computer model error” a story that deniers still try to circulate. The most recent portion of the IPCC's report is coming out soon and it is important to pay attention to their findings. While it is also important to listening to difffereng opinions and alternative views, remember to do your homework. The purpose of this piece is to put certain things in perspective before the larger organizations start picking up on the tripe that the Koch brothers and their allies fling against the IPCC and their findings. Try to consider the source. Also don't forget to educate yourself. You can start with this discussion session I hosted on the Online Ocean Symposium last month.